Make yourself at home in one of the 65 air-conditioned rooms featuring minibars. Complimentary wireless Internet access keeps you connected, and satellite programming is available for your entertainment. Private bathrooms have deep soaking bathtubs and complimentary toiletries. Conveniences include phones, as well as safes and desks. *** THIS WEEKEND ONLY!!!! EXCLUSIVE PROMO 50% OFF***After a busy day exploring the city's numerous sights, the NH Villa de Bilbao is the ideal place to relax, in its spacious and bright rooms. Restaurant must be visited due to its excellent buffet breakfast and also for lunch or dinner with your family. Parking on property and also internet access are available. 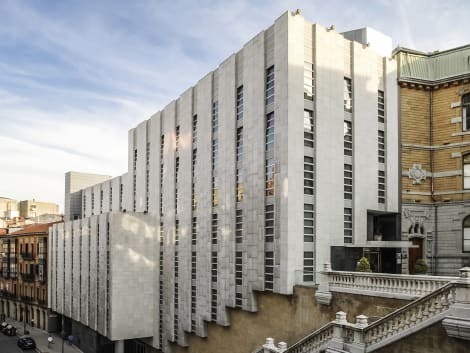 A stylish, contemporary hotel, the 4-star Hesperia Bilbao is found on the city’s waterfront, across the river from the famous Guggenheim Museum. The on-site La Ría restaurant specialises in modern takes on local flavours, and the La Orilla bar serves sushi and cocktails, alongside regular live music and attractive river views. 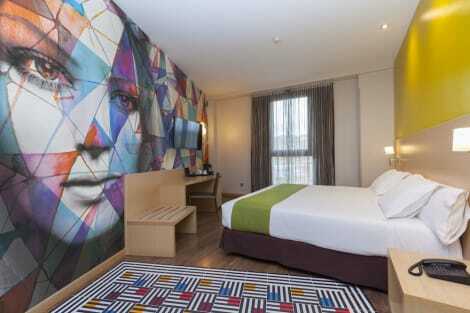 Rooms at the Hesperia Bilbao offer free wi-fi, safes, minibars and private bathrooms. Make yourself at home in one of the 202 air-conditioned rooms featuring minibars. Complimentary wireless Internet access is available to keep you connected. Private bathrooms with bathtubs or showers feature complimentary toiletries and hair dryers. Conveniences include desks and electric kettles, and you can also request cribs/infant beds (complimentary). Located next to the Basilica de Begoña, Holiday Inn Bilbao offers stylish air-conditioned rooms with free Wi-Fi and flat-screen satellite TV. Bilbao Old Town and Etxebarria Park are a 15-minute walk away. Decorated in light colours, the spacious rooms include a desk, an electronic safe and a minibar. The modern bathrooms feature toiletries and a hairdryer. A varied breakfast buffet is served daily at the Holiday Inn Bilbao. The Sarasate restaurant serves fresh local and Mediterranean cuisine. There is also a café-bar with a terrace. The famous Guggenheim Museum is a 5-minute drive from the Holiday Inn. Bilbao Exhibition Centre and Bilbao Airport are both within a 15-minute drive. Car hire can be arranged at reception. *Outdoor swimming pool open in summer. *Gym: ?12 *Spa: ?20 / VAT and towel included.